Features: Keep cool indoors and out by simply plugging the Cool Fan 3 into your portable device. 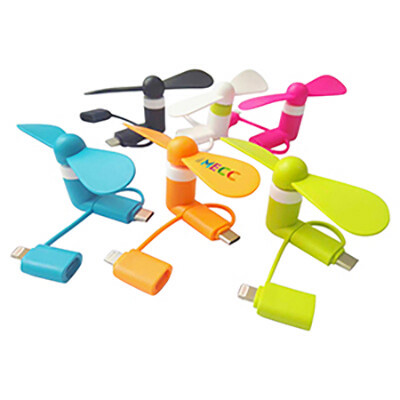 Featuring low power consumption, soft blades and 3 connector options; Micro USB, 8Pin (lightening) and Type-C connectors to work with Android, iPhone and iPads. Rated voltage: 5V, Rated power: 1.0 Watt. Material: TPU. Certification: CE, RoHS. Product Colour: Black, Blue (PMS299C), Green (PMS367c), Orange (PMS151c), Pink (PMS212c), White. Product Size: 88 x 44 x 16 mm, 88 x 20 x 11 mm (blade). Print Area: 20 x 10 mm (blade). Print Process: Pad Print. Delivery: 2-4 weeks (indent) from art approval. Standard Packaging: Poly Bag. Packing Details: 250 pcs per carton, 6.5 Kgs, 28x23x33 cms. Setups: Included.